These are some screenshots of Virtaal. Although it doesn’t show all functionality, hopefully it gives an idea of some of the features. Virtaal can provide word based suggestions for some of the longer words you have used before. This way you can increase your typing speed. Virtaal can also provide suggestions for whole strings from sources such as the current file, previous translations, Open-Tran.eu and several others. Virtaal can highlight placeables and makes it easy to insert them. This avoids typing errors, and increases productivity. Virtaal can highlight recognised terms and makes it easy to insert them. This avoids typing errors, and increases productivity. Virtaal can help you improve your translations with quality checks, either showing the errors in the current translation unit, or by navigating the file in Quality Checks mode. Here Virtaal is Running on Windows Vista. Virtaal should work well on all Windows systems from Windows 2000 onwards with the installer we provide. 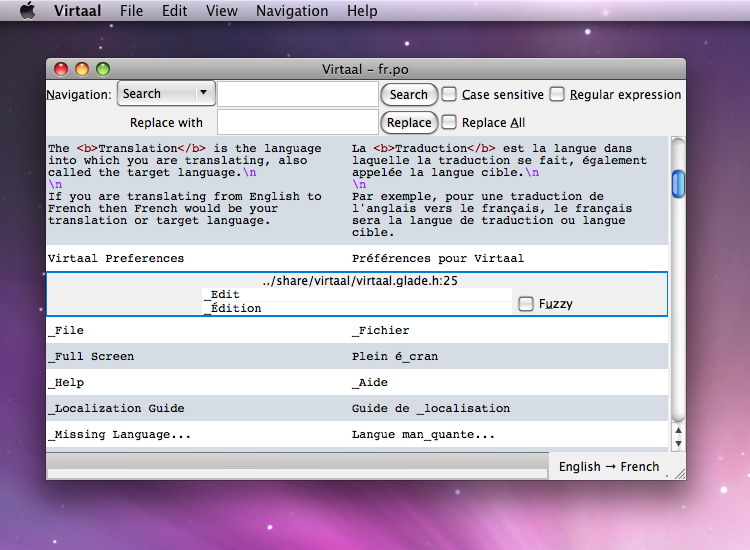 Here Virtaal is running, and nicely integrated, on OS X and shows the search functionality.